One has thin succulent leaves around two inches long and deep pink floppy flowers, it can trail or cover ground. The other has different color flowers on the same plant, yellow, red white and orange. This one is at the back of picture. This one is at front of picture, it also trails or ground cover. Mostly dies back in the winter. The leaves are flat and succulent and the stems are soft but brittle. If you put a bit of this plant in the soil it will root with a week and flower in three. Thanks for getting back to me Stuart - that picture is exactly what it is. So glad you found the name, it really helps with knowing how to care for your plant if you can identify it definitively. Thats it, the name I was after. 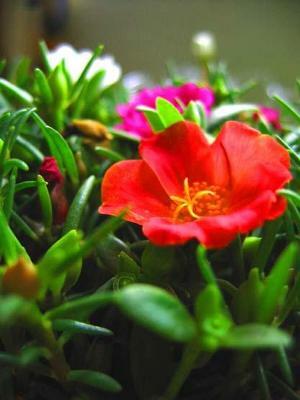 Portulaca! One is grandiflora and I think the other one is Portulaca as well, a different type. I found a picture here. Hi Stuart, these are lovely - what gorgeous colours! I think these are two different plants - the pink one with the ruffled edges looks like a type of Portulaca, which comes in many different colours of flowers on different plants, and the other one with the red petals and yellow stamens looks more like Mirabilis jalapa, also known as Marvel of Peru, or four-o'clocks which has different coloured flowers as they age. 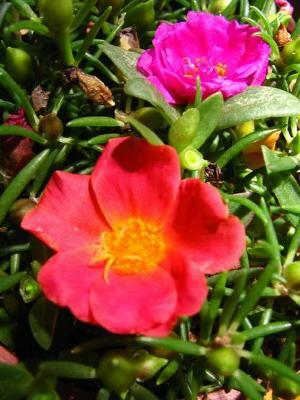 These are both great drought tolerant plants, the Portulaca is mostly grown as an annual, and the Mirabilis can be dug up and stored as a bulb.